You are currently browsing the tag archive for the ‘indisch’ tag. The right tier: ingredients to make gado-gado with the peanut sauce! Sugar snap peas, baked tofu, steamed carrots, (more tofu), brussels sprouts trying to hide behind some salad, boiled egg and serundeng (baked coconut topping). Yummy! So I think I should change my eating pattern. 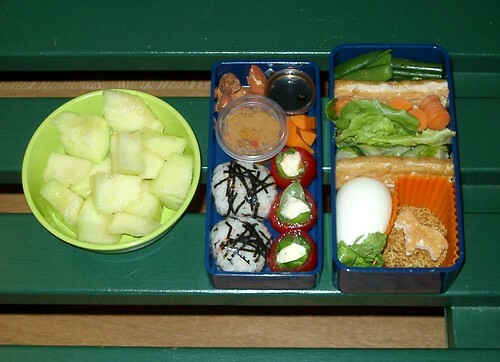 Maybe I am just going to take one sandwich for 10 o’clock, then have my bento at midday and leave a snack (like the rice cracker I didn’t ate) for the afternoon.